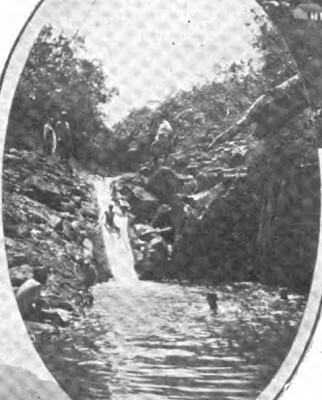 Hawaii : Paradise of the Pacific, 1910. Hawaii : the Paradise of the Pacific. 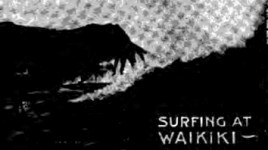 Published for Honolulu's Hawaii Promotion Committee, the book devotes considerable text to the attractions of Waikiki Beach and includes numerous photographs, including thee small images incorporated into the typeface. 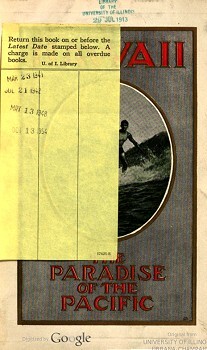 The large photograph by R. K. Bonine (page 37) is reproduced on the cover, obscured by the lending slip. 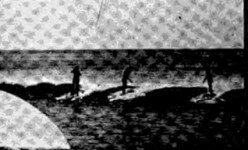 Around this time, surf-riding in canoes and on boards received unprecedented exposure from the combined efforts of Bonine,Thurston Holmes, Jack London and Alexander Hume Ford. Arriving with established reputations, the visitors were welcomed enthusiastically by Honolulu society. "One great joy of Honolulu is the sea bathing, for nothing can surpass it. Those who find delight in this rudimentary pursuit must go to the Hawaiian Islands to understand it in perfection. "These places, as Mercutio said of his wound, 'will serve,' but they fail to approach such bathing as can be found in the cove which lies in the shelter of Diamond Head." —Sir Frederick Treves, Bart, Sergeant-Surgeon to H. B. M., King Edward. Honolulu has the most perfect bathing resort in the world. This is a broad statement, but none of the thousands of visitors who see Waikiki Beach ever go away disputing the claim. 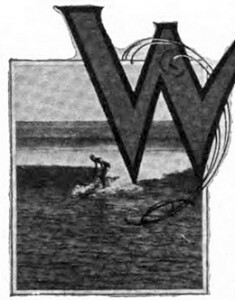 The fame of Waikiki has spread everywhere, and has been described with glowing pens by many noted writers and travelers. Situated in a great curve in the shore, three miles by trolley car from the center of Honolulu, Waikiki Beach, fronting directly upon the vast Pacific Ocean, is yet protected by the great coral reef half a mile or more off shore. Against this barrier the mighty rollers from the sea stub their toes and pitch headlong in foam-crested torrents across the lagoon and on to the white coral sand of the beach. every day in the year for hours at a time, while "grown-ups" share the sport with all of a child's enthusiasm. Waikiki is the safest popular bathing place anywhere. There is no undertow; and the smooth, sandy beach slopes gradually outward, rising again as the edge of the reef is approached. Here one has no fear of sharks, those tigers of the sea, which never cross the ragged edge of the reef into the quiet waters of the lagoon. Here one finds water of depth suited to his fancy. Only at Waikiki Beach may one witness and partake in the remarkable sports of surf-canoeing and surf-board riding, the most exhilarating and fascinating sports in the world. 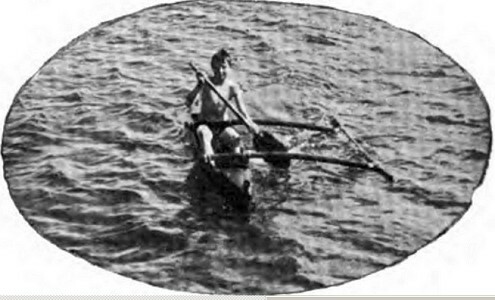 In canoeing, one dons a bathing suit, and in one of the graceful outrigger canoes is paddled by skillful natives out to the edge of the reef, where, when the frail craft is neatly turned before an incoming breaker, it is caught up like a feather on the inclined plane of the front of the wave, and hurtled shoreward in a cloud of spray at express train speed, ofttimes to the gleaming sands of the shore line. Considerable skill is required in performing this same feat on a light board instead of a canoe. 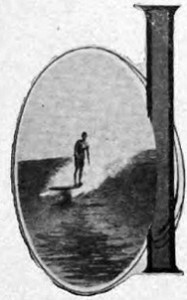 The swimmer pushes his board out through the breakers, and then lies upon it, facing the shore. 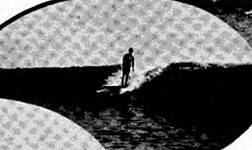 Selecting a suitable wave, he paddles furiously in order to attain momentum, until overtaken by the wave, when, if his skill is what it should be, he will be propelled shoreward like a chip in a mill-race. Adepts are able to kneel, and even stand upright upon their frail support after the exciting ride has been begun, but the novice does not do this with signal success for some time. 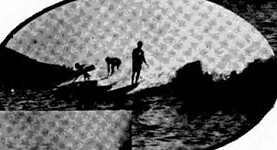 In fact, it is no easy trick to ride a wave at all, and capsizes are many for the beginner. 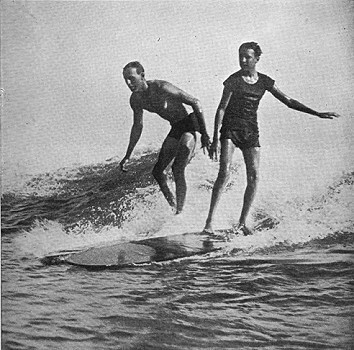 The native Hawaiians have practised surfing since prehistoric times, but at present white boys and men, and even a few women, are close rivals for the honors of first place with them, and daily an animated crowd of surfers seek this lovely beach. Geoff Cater (2017) : Hawaii : Paradise of the Pacific, 1909.